Welcome to my tutorial on UML 2.0 Activity Diagrams! In this tutorial, I’ll show you all of the symbols used to create activity diagrams. Activity diagrams show what actions occur step-by-step to achieve a given goal. Activity symbols are very similar to flowchart notation, so you should find this topic very easy to learn. After the video, I have the entire image I taught from. I think it will be a great cheat sheet. The program I use is available here UMLet. It is free and works on all OSs. Well done man… well done. hello, thanks so much for this great tutorial it was very useful for me as a beginner in developing web apps and mobile apps, i just wanted to know the software you’re using to create these UML diagrams, and if it’s free or not ? You’re very welcome 🙂 I’m very happy that they helped you. I use UMLet Yes it is free and works the same on every OS. are state and activity diagrams are the same?? and, collaboration and component diagrams are same as well? just curious. please let me know!! 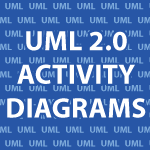 UML Activity Diagrams : Activity diagrams show what actions occur step-by-step to achieve a given goal. UML State Machine Diagrams : State machine diagrams model the changing states of objects and the events that cause these state changes. UML Component Diagrams : Component diagrams are used to show how components are used to create software systems. UML Collaboration Diagrams : Collaboration diagrams show instances or roles of components. A specification is basically just a written list of steps that describe what your system will do. A use case diagram is a simple drawing that demonstrates roughly what the system does. I have found the specifications to be very useful, but the diagrams are too simple for me to find them useful. I make very detailed specs and then move on to very detailed sequence diagrams, but others prefer UC diagrams. I downloaded umlet version 12.2, but I don’t get the connector, output pin, expansion like you have above. i use it in my course at a vocational school in germany ! Thank you 🙂 That is very cool! Great site! Im about to have courses and exam in uml, so having this on the sideline is very helpfull, much better explained than a 400 Zzz paged book! This is an awesome tutorial bro. And what are you doing for living? Are you a programmer? Thank you 🙂 I mainly make Android apps and I run a few online stores for a living.